1. Platinum (Pt) Nanopowder water dispersion should be prevented from sunlight. 1. 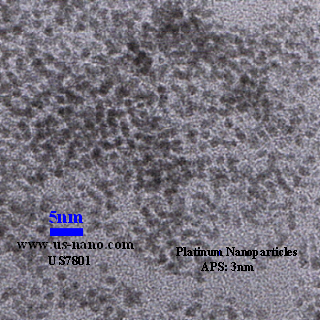 Platinum (Pt) Nanopowder possesses many features: such as high efficient catalyst function, oxidation resistance function and Preservative function. 2. Safe and environmental friendly. 3. Easy to be used. Platinum Nanoparticles Ethanol Dispersion, Platinum Nanopowder Ethanol Dispersion, Pt Nanoparticles Ethanol Dispersion, Pt Nanopowder Ethanol Dispersion,Platinum Nanoparticles Ethanol Dispersion, Platinum Nanopowder Ethanol Dispersion, Pt Nanoparticles Ethanol Dispersion, Pt Nanopowder Ethanol Dispersion,US Research Nanomaterials Inc.,Platinum Nanoparticles Ethanol Dispersion, Platinum Nanopowder Ethanol Dispersion, Pt Nanoparticles Ethanol Dispersion, Pt Nanopowder Ethanol Dispersion,Platinum Nanoparticles Ethanol Dispersion, Platinum Nanopowder Ethanol Dispersion, Pt Nanoparticles Ethanol Dispersion, Pt Nanopowder Ethanol Dispersion,US Research Nanomaterials Inc.,Platinum Nanoparticles Ethanol Dispersion, Platinum Nanopowder Ethanol Dispersion, Pt Nanoparticles Ethanol Dispersion, Pt Nanopowder Ethanol Dispersion,Platinum Nanoparticles Ethanol Dispersion, Platinum Nanopowder Ethanol Dispersion, Pt Nanoparticles Ethanol Dispersion, Pt Nanopowder Ethanol Dispersion,US Research Nanomaterials Inc.,Platinum Nanoparticles Ethanol Dispersion, Platinum Nanopowder Ethanol Dispersion, Pt Nanoparticles Ethanol Dispersion, Pt Nanopowder Ethanol Dispersion,Platinum Nanoparticles Ethanol Dispersion, Platinum Nanopowder Ethanol Dispersion, Pt Nanoparticles Ethanol Dispersion, Pt Nanopowder Ethanol Dispersion,US Research Nanomaterials Inc.,Platinum Nanoparticles Ethanol Dispersion, Platinum Nanopowder Ethanol Dispersion, Pt Nanoparticles Ethanol Dispersion, Pt Nanopowder Ethanol Dispersion,Platinum Nanoparticles Ethanol Dispersion, Platinum Nanopowder Ethanol Dispersion, Pt Nanoparticles Ethanol Dispersion, Pt Nanopowder Ethanol Dispersion,US Research Nanomaterials Inc.,Platinum Nanoparticles Ethanol Dispersion, Platinum Nanopowder Ethanol Dispersion, Pt Nanoparticles Ethanol Dispersion, Pt Nanopowder Ethanol Dispersion,Platinum Nanoparticles Ethanol Dispersion, Platinum Nanopowder Ethanol Dispersion, Pt Nanoparticles Ethanol Dispersion, Pt Nanopowder Ethanol Dispersion,US Research Nanomaterials Inc.,Platinum Nanoparticles Ethanol Dispersion, Platinum Nanopowder Ethanol Dispersion, Pt Nanoparticles Ethanol Dispersion, Pt Nanopowder Ethanol Dispersion,Platinum Nanoparticles Ethanol Dispersion, Platinum Nanopowder Ethanol Dispersion, Pt Nanoparticles Ethanol Dispersion, Pt Nanopowder Ethanol Dispersion,US Research Nanomaterials Inc.,Platinum Nanoparticles Ethanol Dispersion, Platinum Nanopowder Ethanol Dispersion, Pt Nanoparticles Ethanol Dispersion, Pt Nanopowder Ethanol Dispersion,Platinum Nanoparticles Ethanol Dispersion, Platinum Nanopowder Ethanol Dispersion, Pt Nanoparticles Ethanol Dispersion, Pt Nanopowder Ethanol Dispersion,US Research Nanomaterials Inc.